A reader recently asked what would be my next handbag purchase. 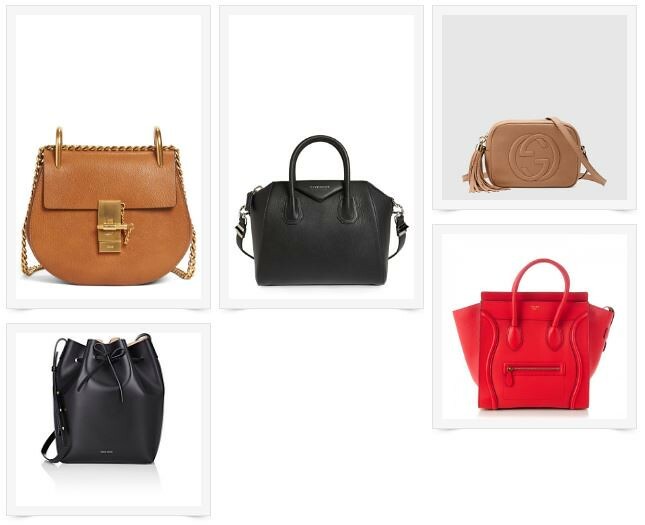 To be honest, I haven't decided on which handbag I am going to purchase next. I am content with what I have and trying to enjoy them. However, I do know which designer handbags I will not buy. I hope you won't be offended by this post. These bags are extremely popular and they're popular for a reason - people love them. They just do not work for my lifestyle and my personal style. Before dropping my $$ on a handbag, I do extensive research and as pretty as these bags are, I have no plans to add them to my collection. 1. Mansur Gavirel bucket bag: If you're a Mansur Gavirel fan then you know how hard it can be to obtain one. Every time they relaunched, their bags almost immediately sell out. However, most of their bags are made of smooth calfskin leather which I am not really a fan of. I recently had a chance to see some of their bucket bags in person and I have to say, I am not impressed. The leather was so stiff and for almost $600, it's just not for me. They recently came out with their saffiano collection but I haven't had a chance to see it in person yet. 2. Celine luggage tote: Another bag takes over the fashion world. When it comes to Celine designs, you either love it or hate it, Unfortunately, the "robot face" design is not for me. Although I have to say, their bullcalf leather is to die for. It's thick, durable and the smell is divine. 3. Gucci Soho Disco bag: Another bag is selling like hot cakes. I do like camera style bags but this bag has missed the mark. #1: The huge tassel (not a fan of anything to do with tassels) and # 2: The strap is long on me even at the highest hole. I had a chance to score this bag for 40% off a few weeks ago but decided to pass. 4. Chloe Drew bag: If you follow fashion blogs then you know the Chloe Drew quickly reached it bag status. I can't put my finger on exactly why I am not a fan. Maybe because it's a trendy bag, the thin shoulder strap, the overall design or maybe a combination of all? To me, a handbag can be such a personal thing. Even though these bags are undoubtedly gorgeous and extremely popular, seeing them everywhere really kills my interest. Very interesting read :) I just noticed that you have the Gucci Soho bag rstyleme linked under your "Current Obsessions"? This is an interesting post. I wouldn't mind reading further reviews with more details. I always enjoy reading your reviews on handbags. You are right, carrying handbags is a very personal thing. It's so hard to gauge if the bag is for you until you know how you like its texture, shape, size and overall look and even how well you carry it. Thank you! @Anonymous Glad you enjoy those handbag reviews. Thanks for stopping by!